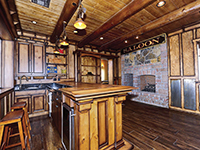 We have been masonry specialists and master craftsmen in custom home building in Cave Creek since 1980, making us the oldest construction company in the area. James Sheehan, the hands-on owner of McKenzie Brothers, has been a master builder and designer for 30 years and looks forward to the challenge of a new project. Did you know that masonry construction plays a large role as an earth-friendly method and is recognized as a contributor to the sustainability of buildings? Resort size great room has massive wood beams, a hidden 'Speakeasy Saloon' and Wine Cellar, Brick Pizza Oven, seven native stone fireplaces, technology and views!. Luxurious retreat located on over four acres with captivating views. This home features a master suite and four additional bedrooms in the main home, along with a home theatre, charming office and separate exercise room. Custom Contemporary Ranch home offers timeless beauty with walls of glass, custom stone details throughout, wood burning fireplaces, outdoor kitchen with margarita station, 30 amp RV outlet and eco-friendly functionality with masonry walls, metal roof, passive solar, extra insulation and private well. High-quality masonry construction and attention to detail is evident throughout this property. New showcase home in an exclusive, mountainous area. Just five minutes to shops and dining. The elevated views and incredible sunsets will take your breath away! Bring the Toys...the 2700 square foot, man-cave car barn, (60'x 45') is ready for 16 + cars. This landmark 3.2 acre retreat includes two stunning and impressive homes with three large garages. Enjoy privacy and the closest mountain views available, at this prime spot for hiking, riding, cycling located aside a trail system leading to the Mountain Preserve. Bring the Toys! Car Collectors - RV Enthusiasts will LOVE the 2700 sf, Man-Cave-Car Barn, 60'x 45' ready for 16 cars or 2 RV's. This gorgeous single level custom home estate will delight the entertainer! Very private setting with incredible mountain views in all directions. 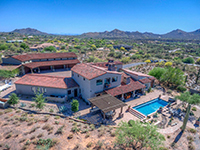 This home that is located in the mountainous area of Cave Creek features an eight-car garage with an office and elevator! There are three bedroom suites that feature incredible views in all directions, as well as an open great room. This home is only five minutes from downtown shops and dining. Amid the breathtaking landscape, your home will become the perfect reflection of your location and personal style. 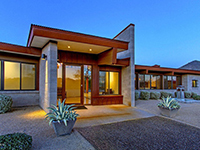 Building luxury custom homes in the Town of Cave Creek since 1980. 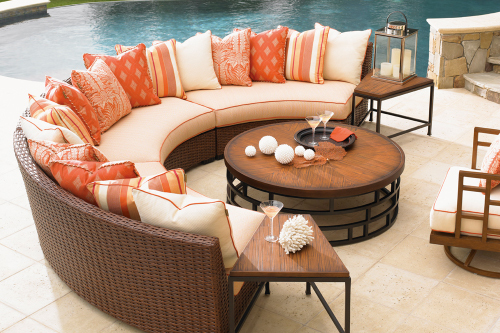 Founded by James Sheehan in 2009, Carefree Outdoor Living can furnish your outdoor living space with high quality, custom outdoor kitchen and furnishings.